Professional interpretation and translation requires a lot more than speaking two languages. That’s where Edgar Hidalgo comes in. Hidalgo is a professional interpreter and one of the instructors for University Extended Education's Interpretation and Translation programs (Legal Interpretation and Translation as well as Healthcare Interpreting). Here he talks about working in hospitals and the court system. He also explains what to expect and how to succeed in a profession that is exciting, demanding, gratifying, and one of the fastest growing in the United States. Q: How were you introduced to interpretation/translation as a career? Initially I wanted to be an electronic engineer. I thought doing interpreting on the side would help ends meet so I went to a trade school that trained interpreters. One day in class, they handed out flyers from a new bachelor’s a program in interpretation from Cal State Long Beach. I enjoyed those classes so much I knew I wasn’t going to just do trade school. I was going to go full throttle and make interpretation a career. Q: What about the field attracted you so strongly? I have a love for knowledge. And in this job, you get to learn from people in many fields: doctors, lawyers, judges, and a wide array of experts. That’s one of the main requirements for interpreters/translators: they have to love knowledge, especially written language and literature. Q: As a profession, interpretation/translation also ranks high in benefit to society. Can you explain the personal satisfaction you get from your work? Some work is more gratifying than others. Working in hospitals is very gratifying when you get to help people in the process of getting cured from illnesses. In the court system, most defendants we help see us as heroes. In an environment where they are often viewed as criminals, we might be the one person, aside from their attorney, who is there to help them. In fact, we often get to talk to the accused party even before any lawyer does.
" In the court system, most defendants we help see us as heroes. In an environment where they are often viewed as criminals, we might be the one person, aside from their attorney, who is there to help them." Q: Both courthouses and hospitals sound like dramatic places to work. Does that take an emotional toll? It can. As an interpreter, you are going to be there for very happy and very sad moments. In a hospital, you might have to tell someone that they have cancer. Or you might have to tell parents their child has leukemia. Those sorts of things can be tough. On the other side of the coin, you can also bring someone the good news that they are in remission. The same dynamic applies in court. Sometimes you encounter people that are guilty but manage to beat the system. So you get to see the good, bad and ugly of the court systems. Now, not all assignments are this dramatic. Currently, I work in Child Support for the San Bernardino Superior Court. It’s much more laid back. No one is getting a life sentence. I help people fill out applications: what’s your name, what’s your address, short trials; simple things. But it’s still important. Legal matters are all important. One word can make a big difference. Q: How much does interpreting in these environments differ from the interpreting many students may have previously done for family members or in their community? Professional interpreting is a shift most people aren’t prepared for. It’s a different monster. You are going to be under a lot of pressure. Here’s an example I always give: If you are in a trial, you are interpreting for a witness who is probably somewhat bilingual. Sometimes the district attorneys and/or the defense lawyers are somewhat bilingual. The judge might be bilingual. Half the jury and half the audience might be bilingual. You are going to be under the microscope and they are just waiting for you to make a mistake. The pressure can be enormous. And the amount of vocabulary you need to know off the tip of your tongue can be overwhelming.
" The instructors all have years of experience in the courts and they will tell you exactly what you are going to encounter—because they encounter it themselves." Q: How does this program prepare students for interpreting in these stressful situations? Our students have a language lab where they interpret. I listen to them and provide immediate feedback. Sometimes they have to do it in front of the class. We try to expose the students to situations that are similar to real life. The material we use is all taken from the courts. The things you see in this program are the same things you are going to see in real life. The instructors all have years of experience in the courts and they will tell you exactly what you are going to encounter—because they encounter it themselves. Put together our experiences, our materials, and the classroom exercises, and students will receive excellent preparation for what they will experience in the profession. 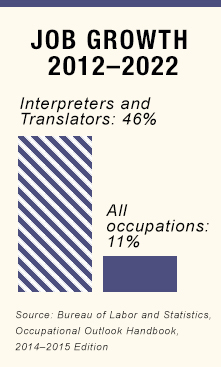 Q: How is the current job market for interpreters/translators? It is a profession in high demand right now. And I am not the one saying that. The Department of Labor Statistics projects that over the next 10–20 years it is will be one of the professions with the highest growth in the nation. Certain sectors have gone down, though. For example, court hiring has gone down because of budget issues. But other sectors have boomed, especially the medical field. Then there is also transcription. They are hiring left and right. Telephonic interpreting has also grown a lot. Some sectors have boomed, while others may be declining. Q: What advice would you give someone considering interpretation/translation as a career? You’ve got to assess whether this is something you really want to do. You need to have a passion for this, because it’s easy to give up. You need to have a love for languages, for literature, and for knowledge in general. Just as in everything in life, interpreting/translating is a skill that you have to use or you’ll lose it. You have to constantly be practicing, even after you’re a professional. If you understand this, you will do very well in this career. 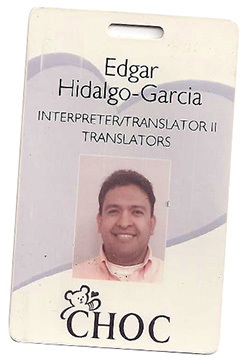 Edgar Hidalgo has been a professional translator since 2000 and is certified in both medical and court interpretation. 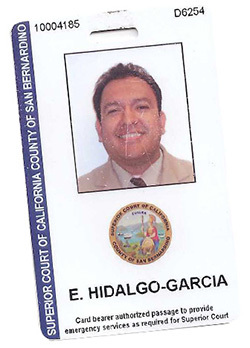 Since 2006 he has worked as a Certified Court Interpreter at the San Bernardino Superior Court. 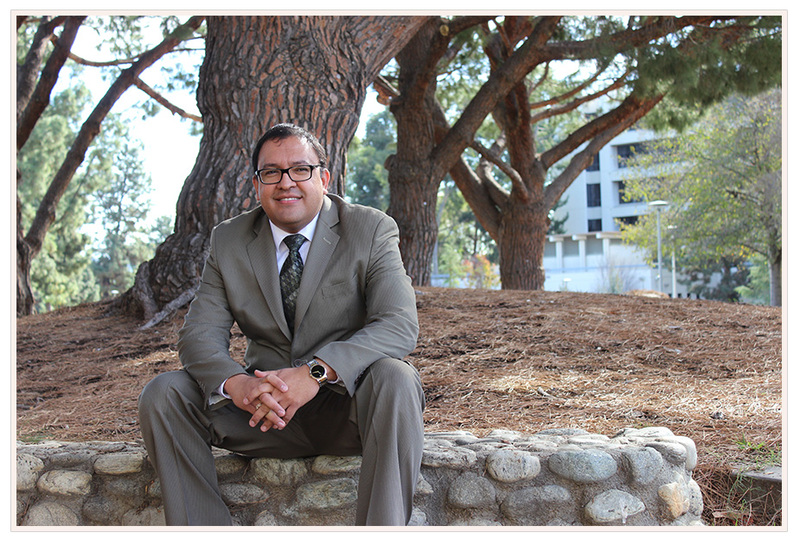 He previously served as a Medical Interpreter/Translator at Children’s Hospital of Orange County, and as a Spanish Interpreter for Long Beach Memorial Medical Center.